Yes – I actually said these words to my older son this week. Now before you go all PC or DCF on me rest assured there is no toddler "fight club" working at our house. I think a bit of a current events lesson though , would be helpful to understand where this came from and what it means. 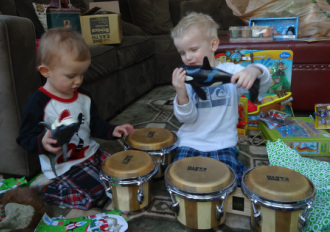 The boys during a friendly moment on Christmas morning. Having boys you expect loud, rambunctiousness. You expect games and racing around the house. And you expect fights. And even though they are still young, my boys are no different. They race cars through the living / dining room (the person who first designed open concept floor plans must have had lots of children who needed a space to work off their energy). They jump from the couch to the bean bag chair. They take toys away, and yes occasionally – oh honestly – frequently – they fight. 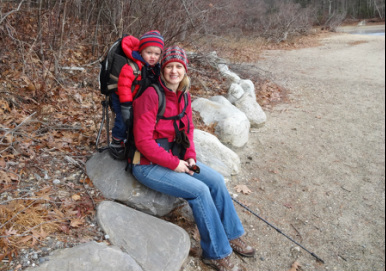 Matty & I taking a quick break on our hike around Walden Pond. When they actually fight, it is interesting to watch each one’s technique. Will likes to lay on top of Matty and generally roll him flat. Matty pushes and then lunges in for a bite. Regardless of who is the aggressor someone is crying in about 30 second and one of us tall people is dragged into the arena to referee. Now the fights of a 3 ½ and an almost 2 year old are not WWE worthy. They are not even local access worthy. Their fights predominantly involve the two of them pulling at the same toy and screaming “I had it first” or “It’s mine”. All very high drama, I expect Masterpiece to be calling for the rights any day. If it was not for their frequency it would all seem quite funny. We have tons of cars, trucks, and construction vehicles in the family fleet, but oh no – they only want what the other one has. We are trying to get them to buy into the rule of – if you put down toy A and pick up toy B – than toy A is open season for your brother to then use. The only total hands off items are personal blankets and a stuffed animal dog they each have (of course with the same name Milo). It is during the non-fight times when my words of wisdom were imparted to my older son. In general, he is a great kid. He is (not untypical for first borns) more rule bound and will toe the line as expected. Matty the second born is the free spirit. I (also being a second) cannot hold this against him, but wow – what a difference. Matty pays no mind to the rules of the game or of the house. He is his own man – well his own toddler. One game Matty really likes to play is “Hit my big brother on the head with something hard”. Out of nowhere he seems to appear and wham – knocks Will on the head with a wood block, a car, or even a tub toy. In response, Will gets upset and often cries, he is a softer soul for sure. 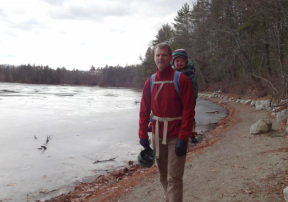 Will & dad also enjoying the hike. After watching this exchange go on and on, I decided it was time for a new approach. Reprimands and interventions with Matty have not worked and the behavior needs to stop. That is why I told Will, if Matty hits you like this – hit him back! When Will cries it just reinforces Matty to do it again so Will needs to stand up for himself and put an end to his little brother’s thrashings. Yes – it all sounds so old school, eye for an eye stuff. But let’s think of the bigger ramifications if the behavior goes unchecked. Matty thinks he can just hit people? What happens when he starts doing this at school or with friends (they will hit him back harder)? How often will I be called into the principal’s office during his Kindergarten year as he tries to bully his way across the playground? Will becomes a door matt. He needs to realize that he can (and should) defend himself at least a little bit. I’d hate to think of the self-esteem blow when it eventually sinks in “I let my little brother kick my a**”! I have made it clear to Will he is not to hit first – or he will have me to answer to. “No thank you Matty” with which ever block is closest.